Are you a Liquorice Allsorts lover? These Jelly Buttons are the perfect treat for you. 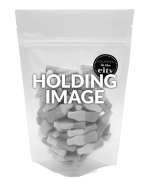 Their aniseed flavour and crunchy sugar sprinkle coating makes them an iconic part of the Liquorice Allsorts mix, and now you can buy them on their own – and in bulk! Get a 250g or 3kg bag and enjoy. Ingredients: sugar, glucose syrup, nonpareille (sugar, wheat starch, glucose syrup, colour (beetroot red), plant extract (spirulina), glazing agents (coconut oil, bees wax)), water, pork gelatine, fructose, corn starch, aniseed oil.